Here’s a study in sprite animations that [Travis Goodspeed] put together. He’s working with one of his favorites, the pink IM-ME device that he’s been hacking on for a while now. But if you don’t have this hardware that shouldn’t discourage you. There’s a lot to be learned from his methods which will translate to any microcontroller working with a graphic LCD. He starts with a 24-bit PNM sprite that includes three frames of his desired animation. From there he needs a way to store the data for use with 8-bit microcontrollers. He chose to write a Perl script that will translate the image format into a 1-bit map. Each frame of the animation takes up a column width that is a multiple of 8 for easy retrieval by the processor. This translation into a C array, and the accompanying code that translates it into data for the frame buffer is the key to the animation process. What is he shooting for? 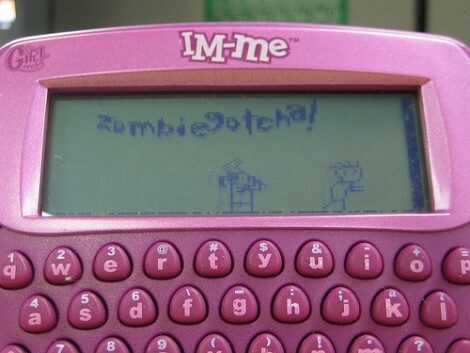 A sprite-based video game on the handheld. umm… where’s the link to the actual article of Travis? haha it’s missing, but I found it on his blog. Grrr…. sorry about that. Fixed. Doesn’t Gimp write out a byte array like this if you tell it to save an indexed image as a .h file? Oh now that the article is there I see that the Perl script generates packed arrays, which the Gimp does not do afaik. Using a Bus Pirate, you can sniff the SPI traffic to the LCD and grab the images back out.